How does a restaurant stand out these days? 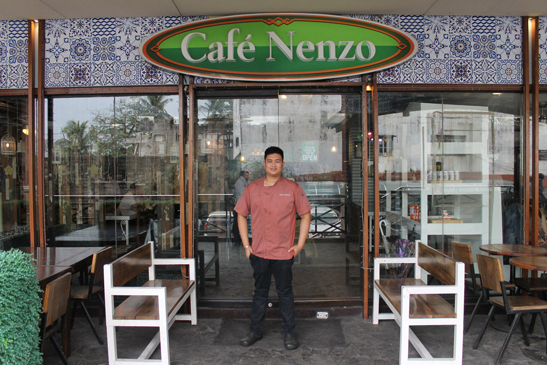 For Café Nenzo’s head chef and co-owner Chino Abacan, it’s their online connections that have helped them gain customers all these years. Through social media, Chino Abacan, 26, head chef and co-owner of Café Nenzo, stays in touch with his customers. Located in Meycauayan, the five-year-old restaurant is among Bulacan’s top-rated restaurants on US-based travel website TripAdvisor, which compiles crowdsourced restaurant and hotel reviews worldwide. Abacan says new customers usually find them online, thanks to good reviews and their extensive social network. “We do our marketing only via the Internet. We don’t have traditional materials, like flyers and posters. Everything is done through our Facebook and Instagram pages,” said Abacan. Café Nenzo’s marketing team is in charge of updating their social media pages, as well as responding to customer inquiries online. “Aside from using our Facebook and Instagram pages to inform our customers about our new dishes, promos and events, we also use these channels to answer customer inquiries and to take reservations,” Abacan said. Today, Café Nenzo has some 35,000 followers between their Facebook and Instagram accounts, and they are still growing. “I also have my own Facebook account, and I make it a point to reach out to customers myself,” he added. As Bulacan becomes a foodie haven, good connectivity has helped restaurants like Café Nenzo by helping them leverage social media to grow their business. “When I was younger, social media helped me stay in touch with my friends. Now that I have my own business, it helps me stay in touch with my customers as well,” Abacan said. To address the continuously growing mobile data and connectivity needs of Bulacan residents and businesses, PLDT and its wireless subsidiary Smart Communications, Inc. (Smart) have upgraded both their fixed and wireless networks in the province, especially in the main component cities of San Jose del Monte, Malolos and Meycauayan, to name a few. “These efforts to improve our network in key areas like Bulacan are part of our overall thrust to provide better customer experience across the country,” said Mario G. Tamayo, senior vice president for network planning and engineering for PLDT-Smart. “With better connectivity, we are not just empowering local businesses like Café Nenzo and helping them find their customers, we are also helping our customers in Bulacan access important online services, like emails, online banking and shopping,” Tamayo said. PLDT has committed historic levels of resources for network transformation. For 2018, PLDT capex was expected to reach P58 billion.